Surveys show the beetle has infested 21 million acres and killed 411 million cubic feet of trees -- double the annual take by all the loggers in Canada. In seven years or sooner, the Forest Service predicts, that kill will nearly triple and 80 percent of the pines in the central British Columbia forest will be dead. Meanwhile, the beetle is moving eastward. It has breached the natural wall of the Rocky Mountains in places, threatening the tourist treasures of national forest near Banff, Alberta, and is within striking distance of the vast Northern Boreal Forest that reaches to the eastern seaboard. Foresters and researchers agree that the principle culprit is global warming (because warmer winters, even by a few degrees, have not been severe enough to kill the native beetle and supress its now-exponential population growth). 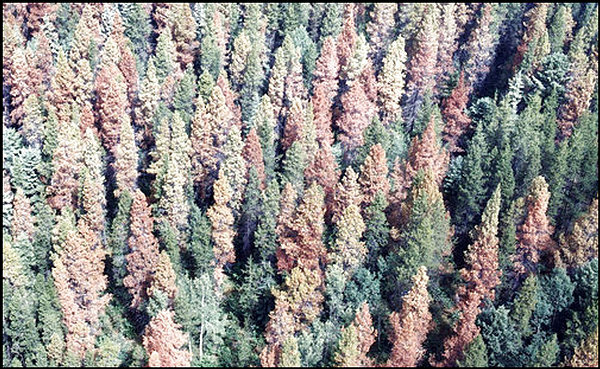 So the pine beetle infestation is worrisome, not only for the severe ecological impacts, but also because it appears to be an early sign of the devastation to be wrought by a warming atmosphere. The world is celebrating an announcement in Vancouver on Tuesday that the government of British Columbia finally signed on to a new vision for a region of the province nicknamed the Great Bear Rainforest--a vast, nearly roadless forest of cedar and hemlock stretching along the coast from the northern tip of Vancouver Island to Alaska. The agreement announced by B.C. Premier Gordon Campbell -- and built by First Nations who live in this area­­, environmentalists and logging company representatives,--is being called "A New Vision for Coastal B.C." That's not just P.R.--it really is a vision, a new way of thinking about and creating conservation that was a decade in the making. In fact, contrary to some of the more romantic news reports, environmentalists and native leaders working on the Great Bear haven’t seen a U-Lock, or even a bullhorn, in at least half a decade. Instead, they’ve logged thousands of hours under fluorescent lights in stale meetings rooms at airport hotels and YMCAs, far from the tall trees and leaping salmon. They got to know people they didn't necessary like at first--mid-level bureaucrats, loggers, big-box retail executives. In doing so, everyone involved changed their thinking about the forest, their communities and the coastal economy. Listen to CBC News for some good interviews with key negotiators (see the bottom of this page), or reporter Clifford Krauss' audio commentary on the New York Times' web site for a clearer picture of what happened. The entire region will be "zoned" into three tiers of special management areas. More than a third of the region—the "Protected Areas" and "Biodiversity Areas"--will see no commercial logging. However, mining is allowed in the Biodiversity Areas. Tourism is OK too. What's more, some 25 First Nations living in this region, in communities like Hartley Bay, Klemtu and Bella Bella, will share management authority with the province. They'll have access to the Protected Areas for traditional and cultural use--that's not the case with parkland. They can fish, harvest cedar for carving totems or other cultural activities, and worship at their sacred sites, for instance. 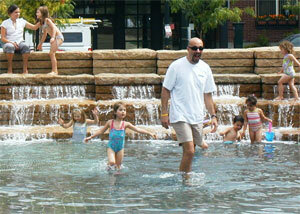 It's a way of thinking about people and place with a long-term vision for sustaining both. The key to the deal still rests on a gamble. The environmentalists' winning strategy was a huge $120 million "conservation financing" campaign. In less than five years, they managed to raise $30 million, with the assistance of private foundations, to fund budding entrepreneurs in native communities that agree to embrace sustainability- micro-businesses like eco-tourism, certified forest products and shellfish aquaculture. They double-dared both the province and the feds to match that number. The B.C. Liberals agreed to do so yesterday. The newest complication is the recent federal election. Canada now has a Conservative prime minister from the oil fields of Alberta--not exactly a man envisioning sustainability. The immediate step forward is brokering a commitment from Ottawa. Well, most British Columbians would never believe that a premier of this province would ever thank Greenpeace--known widely as the "Enemies of B.C." in the 1990s. He did this week. Perhaps Stephen Harper is next. Editor's note: This is by Gordon Price, former city councillor for Vancouver, BC, Director of the City Program for Simon Fraser University, and NEW board member. In my 15 years on City Council in Vancouver, I read a lot of reports. Ninety percent of them were not exactly stimulating: lane pavings, grant approvals, appointment of the external auditor … all the things that keep a city going. Occasionally, a report would appear that grabbed your attention – and on a very rare occasion, would actually change your understanding of the world, or at least your city. I’d like to say that such a report recently appeared on the agenda of the City of Vancouver. But it didn’t. It appeared in Burnaby – the municipality just to the east. And what a subject: "Global Peak in Oil Production: the Municipal Context." For those interested in the subject, there’s not a lot that’s new in the report; it’s primarily a background piece. Even on those terms, it makes informative reading. What makes it significant, however, is that it was requested by politicians, prepared by staff and comes with the seal of government –- as far as I know, the first such report of its kind in Canada. It’s not as dry as you might guess, what with some amusing quotes at the head of each section - "Today no one disagrees that the wolf is out there but differences in analyses and opinions as to when it will attack the sheep still prevail." It provides a Canadian perspective, and, after noting that "It is too late to panic. It is time to plan," it provides an appendix of actions that the municipality might take. Will action follow? I haven’t heard the results of the debate, but the mere fact that a government body is opening the door to a subject that most leaders would prefer remain firmly shut off is a tangible action all on its own.